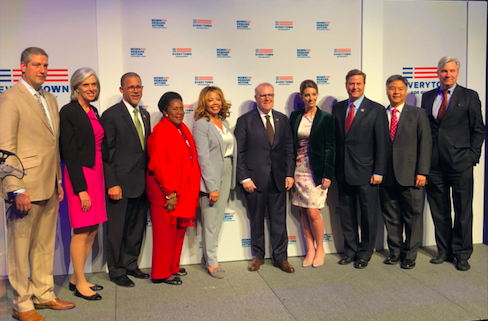 Everytown for Gun Safety and Moms Demand Action held a post-midterm reception at the Newseum on Thursday, November 14th to bring together members of Congress, gun safety advocates, and survivors of gun violence. 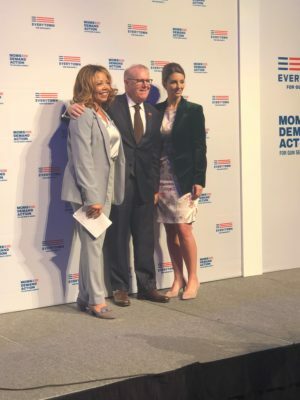 Everytown President John Feinblatt and Shannon Watts, the founder of Moms Demand Action hosted the reception featuring photos on the jumbo screen of moms and families canvassing for candidates. Many members of Congress came to show their support including Senators Amy Klobuchar, Sheldon Whitehouse, Richard Blumenthal, and Reps. Sheila Jackson Lee, Tim Ryan, Mike Thompson, Ted Lieu, Earl Blumenauer, Suzanne Bonamici, Katherine Clark, Brian Fitzpatrick, Jerry McNerney, Jan Schakowsky, Brad Schneider, Donald Norcross, and Ted Deutsch. Newly elected Representative-elects showed up to support the cause including the aforementioned Lucy McBath as well as Jason Crow, Mikie Sherrill, Chrissy Houlahan, Dean Phillips, Jason Crow, Mikie Sherrill, and Chrissy Houlahan. Other notables in the crowd included Kathleen Biden, Heather Podesta, Bob Costa, Tom McMillan, Kevin Cirilli, Steve Elmendorf, Francesca Chambers, Ted Johnson, Mark Mellman, Bill Knapp, and Robyn Bash.